For truly simple living, we need to be able to make our own clothing, perhaps even from fabric we create ourselves. People did this for centuries, making not only simple garments for everyday, but also more elaborate garments for special occasions such as feasts, festivals, weddings and funerals. Sewing the garment seams, etc. Read on for Working Without a Pattern, which uses two examples, the Japanese Hippari (jacket) and Monpei (pant) to show how this is done – without wasting any fabric. I want to express my gratitude to Folkwear Patterns for intruducing me to this concept. Roman toga: long rectangles of fabric draped and wrapped over/around the body and secured with cords if necessary. Japanese kimono: fabric rectangles sewn together to form the body and sleeves. Japanese hippari and monpei: modified fabric rectangles sewn together as jacket and pant. These garments are used to illustrate more detail, below. Turkish panel coat: fabric rectangles sewn together to create a long, slightly flared coat with long sleeves. A sample of this garment (made from handwoven ikat scarves from the Middle East, lined with China silk and trimmed with ribbon from France) is shown at the top of this post. I also include a sketch of the layout, below. These were made without decoration (or with simple decoration) for everyday wear, or highly decorated (such as bead work, braid or embroidery) for special occasions. See Folkwear Patterns for more inspiration. The hippari is made of two long rectangles to form the body, 2 squarish rectangles for the sleeves, and two long, thin rectangles for the band. This is similar to a simple kimono design, and no fabric is wasted with this design. See Japanese Hippari (Jacket): Design and Construction for more detail. And this diagram shows the finished hippari. For garment design and construction details, see Japanese Hippari: Design and Construction. The monpei is made of four long rectangles, two for each leg, and is secured about the waist by a drawstring. It requires a simple trick to allow the fabric to fit between the legs to form a crotch. As with the hippari, the monpei does not waste any fabric. 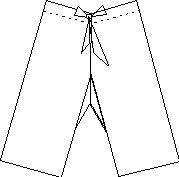 See Japanese Monpei (Pant): Design and Construction for more detail. The following diagram shows the finished monpei. This diagram shows the arrangement of one leg before the inseam (the seam down the inside of the leg), is sewn and the two legs sewn together at the top of the pant. For garment design and construction details, see Japanese Monpei: Design and Construction. 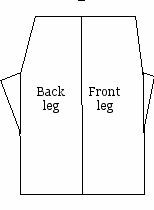 Like the Japanese examples above, this coat also wastes no fabric by cutting away part of one piece to use elsewhere in the coat. 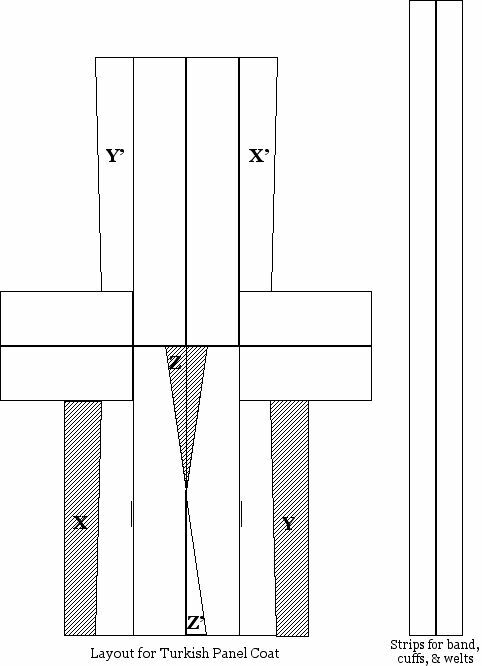 In this sketch, cut-away piece X is reused as X’; Y is reused as Y’; and Z is reused as Z’ (there are two Z’s but only one is shown). A photo of a finished Turkish panel coat is shown at the top of this article. You can view the layout at Turkish Coat-Layout (pdf). Front bands are made the same way as on the hippari jacket. Bands along bottom of the coat, are cut the same width as the band, in 4 lengths that are joined together at each end in order to reach all around the coat. Cuffs, which are cut the same width as the band, but only long enough to fit the width of the sleeve bottom. Pocket opening flap is cut from same fabric as band, but a much shorter and narrower rectangle. (The pocket position is shown on the diagram). The lining is made the same way as the outer garment, but of a light-weight fabric such as China silk. See TurkishCoat-Layout for a pdf version. 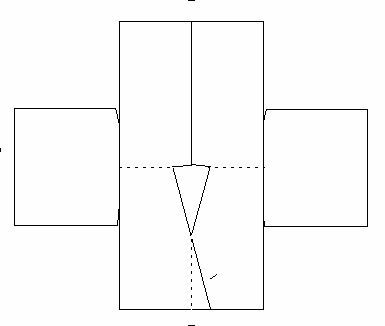 Next in this series will detail how to create a sloper, draft a block from a sloper, and draft a pattern from a block. Never have heard of a sloper or a block? These are the preliminary patterns used by designers to create all their garments for a specific size, or to fit your body in particular. This entry was posted on Monday, February 13th, 2012 at 4:51 pm and is filed under Sewing & Fiber Arts, Survival; Primitive Living. You can follow any responses to this entry through the RSS 2.0 feed. Both comments and pings are currently closed. This has been such an interesting reading. I did not read it all but I plan too. Your draftings and explanations are a huge help. I don’t know how to sew but want to so much. With people like you around this “dream” should become true, sooner than later, I hope. Thankyou,Joanne, for your kind words. I’ve been sewing by hand since I was 3 and on my Mom’s machine since I was 7. I love to sew and now I’m learning how to draft my own patterns from scratch – great fun! Good luck to you, and anytime you have a question about sewing, drop me a line! I practice naginata and I’ve been looking for a pattern for a keikogi without success. And I know I’m not alone from other postings I’ve seen on the internet. My ohara isn’t as small as the one’s most Japanese students have and unless I drop weight, making one is the remaining option. With my old one as a partial pattern, your instructions, and the instructions I have for sleeves and lining other Japanese garments, I think my problem is solved!